Begin with a baked cookie crust and spread cream cheese and yogurt topping, add fresh fruit and top with a sweetened citrus glaze. Chill before serving this sweet pizza! Spread and press cookie dough into greased oblong pan. Bake 10 to 15 min and allow to cool. In large mixing bowl, Soften cream cheese and fold in yogurt. 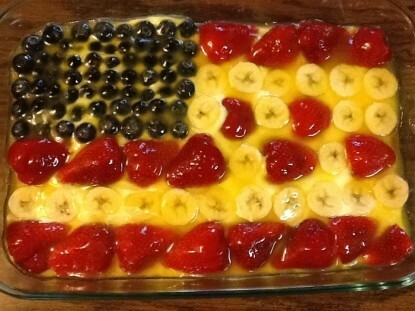 Arrange fruit to look like flag. In a saucepan, combine sugar, corn starch, orange juice, lemon juice and water. Bring to boil and cook for 2 minutes until thickened. Remove from heat and allow to cool but not set up. Spoon over fruit. Chill for two hours and serve!